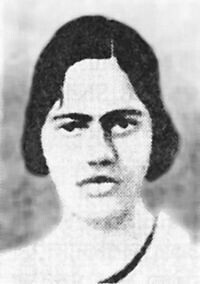 Pritilata Waddedar (May 5, 1911 – September 23, 1932) was a Bengali anti-British revolutionary nationalist. She was the first Indian subcontinent woman revolutionary to fight the British. She was very meritorious student. After completing her education (First division in matriculation from Dr. Khastagir Government Girls’ School of Chittagong and securing Fifth place in Intermediate examination from Eden College, Dhaka under Dhaka Board) she attended Bethune College in Calcutta (now Kolkata). She graduated in Philosophy with distinction. After a brief stint as a school teacher, Pritilata joined a revolutionary group headed by Surya Sen. In 1932 She led a 15 man team of revolutionaries in an attack on the Pahartali European Club, which had a sign board was written “Dogs and Indians not allowed”. The revolutionaries torched the club and were caught by the British police later. In order to avoid arrest, Pritilata consumed cyanide and committed suicide. Thus ending her short endeavor in fighting for freedom of her country. Some say that she committed suicide voluntarily to convey the message that women can, and have to sacrifice lives for securing the freedom our country from British Colonial Rule.